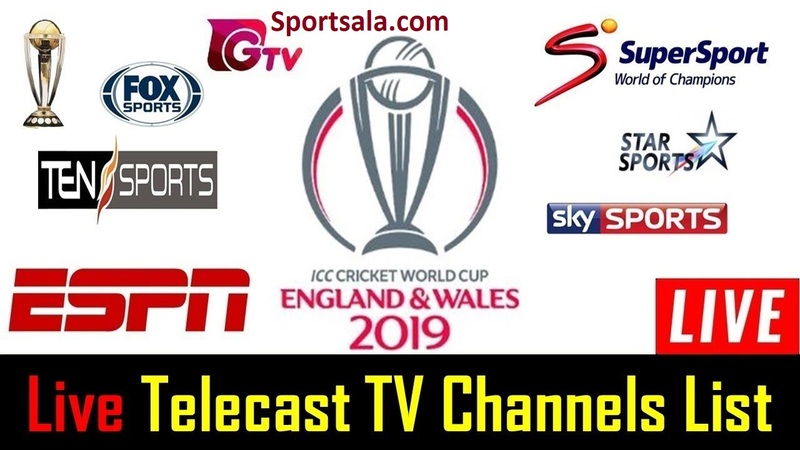 Get ICC Cricket World Cup 2019 Live TV Channels Broadcasting List. ICC has announced that CWC 2019 will be starting from 30 May in England & Wales. This mega cricket tournament will be broadcast live all over the globe. Many TV Channels has bought official Tv Channel rights to live telecast Cricket World Cup 2019. Here you will find all the Tv Channels that will bring live coverage across the globe. As per announcement of ICC, Cricket World Cup 2019 is scheduled to be held from 30 May in England & Wales. A total of 48 matches will be played in this season of World Cup to get the Champions. Moreover, ten teams will take part in CWC 2019 that are India, Australia, Pakistan, Sri Lanka, Bangladesh, Afghanistan, New Zealand, England, South Africa and West Indies. We have compiles a list of all TV Channels and Live Streaming sites that will live stream World Cup Live matches in different countries. Check this list to know which TV Channel will broadcast Cricket World Cup 2019 Live in your country. Star Sports is a Sports Tv Channel in India which is owned and operated by Star Network India. This sports Channel Live telecasts sports programs such as cricket, football, tennis, golf, hockey, wrestling and Moto GP. However, this year Star Sports have acquired official TV Channel rights to broadcast ICC Cricket World Cup 2019 Live Star Sports in India and Subcontinent Countries( Nepal, Bhutan, Bangladesh, Pakistan, Sri Lanka, Maldives and Afghanistan. Moreover, this online cricket lovers can also watch ICC Cricket World Cup Live Streaming at the official web platform of Hot Star. All the world cup 2019 matches will be live streamed at Hot Star. Willow Tv is one of the top live streaming brands that bring live streaming and highlights videos for the Live Cricket matches across the globe in U.S.A. However, Willow TV has attained the official live streaming rights for ICC Cricket World Cup 2019 matches live in United States of America. Hence, the online cricket geeks from U.S.A can enjoy watching live CWC matches at Willow Tv. Sky Sports Cricket in one of the top sports channel when it comes to cricket live coverage in United Kingdom. The Sky Sports Cricket is owned by the Sky Network in United Kingdom. This sports channel usually broadcasts England team cricket matches live for English cricket fans. However, Sky Sports will be live telecasting Cricket World Cup 2019 matches live in England. So, if you are living in United Kingdom and want to watch Cricket World Cup 2019 matches live, you can switch your Tv set to Sky Sports Cricket to enjoy the live broadcast during Cricket World Cup. Fox Sports has bought the official TV channel rights to live telecast the ICC Cricket World Cup 2019 in Australia. This Sports channel is owned and operated by Fox Network in Australia. Usually, the sports channel broadcasts the soccer, racing, football, fifa and tennis matches in Australia. However, it will be live telecasting the Cricket World Cup 2019 from 30 May in Australia. So if you are an Australian Cricket fan and want to watch the ICC Cricket World Cup matches live on Tv, you can switch your TV channel to Fox Sports. Apart from it, the online cricket fans can also watch ICC Cricket World Cup Live Streaming at Foxtel Sports digital platform. Super Sports is a Sports TV channel in South Africa that usually telecasts South Africa cricket team Live matches in South Africa. However, this year Super Sports has attained the official TV channel rights to broadcast ICC Cricket World Cup 2019 matches in South Africa. Hence, if you are living in South Africa and want to watch the Cricket world Cup matches live, you can enjoy it at Super Sports. Moreover, the CWC 2019 Live streaming will also be available at the official live streaming site of Super Sport. OSN Sports has acquired the official Live Tv channel rights for the Cricket World Cup 2019 in Middle East and North African countries. Hence, if you belong to any of the MENA country and want to watch live coverage for CWC 2019, you can enjoy live cricket action at OSN Sports Cricket HD. Ghazi Tv which is commonly known as Ghazi Tv and broadcasts Bangladesh Cricket Matches in for Bangladeshi Cricket fans, has attained the official rights for the Cricket World Cup 2019 Live broadcast in Bangladesh. Hence, if you are a Bangladeshi Cricket fan and want to watch live Tv match during Cricket World Cup, you can enjoy it on Ghazi Tv. Moreover, the Live Streaming service for ICC Cricket World Cup 2019 will be also available at Ghazi TV Live Streaming YouTube channel. Pakistan Television Network will live telecast ICC Cricket World Cup live matches at PTV Sports in Pakistan. Moreover, the PTV Sports Live Streaming during CWC 2019 will also be made available at the official YouTube channel of PTV Sports.